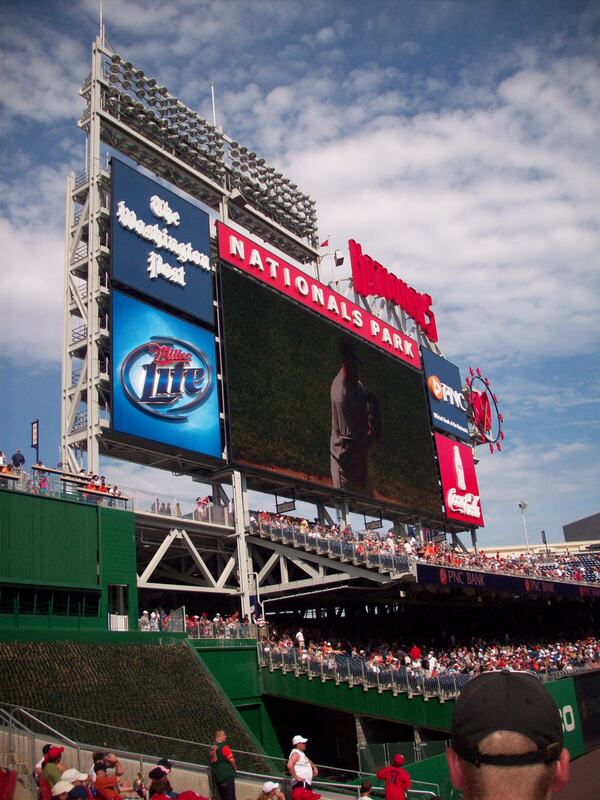 Ballpark Basics: It took almost 35 years to bring baseball back to D.C. Fans are optimistic that the hopes for growth and revitalization they’ve pinned on this team won’t take quite as long. Ballpark Basics: The world’s most powerful city was without baseball for 33 years. The original Washington Senators has left for Minnesota in 1961, and the reincarnated Senators left for Texas exactly ten years later. For many years thereafter, baseball fans in DC and surrounding areas rallied behind the closest team around – the Baltimore Orioles. 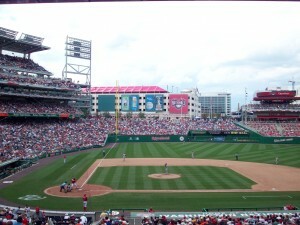 Baseball finally returned to the District in 2005 when the Montreal Expos moved down to the nation’s capitol. 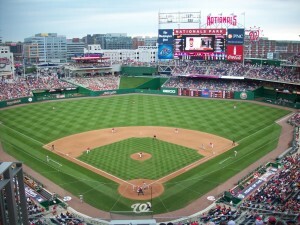 The newly renamed “Nationals” played in RFK Stadium, the same stadium that the last Senators team played in, for the first three years while Nationals Park was built. 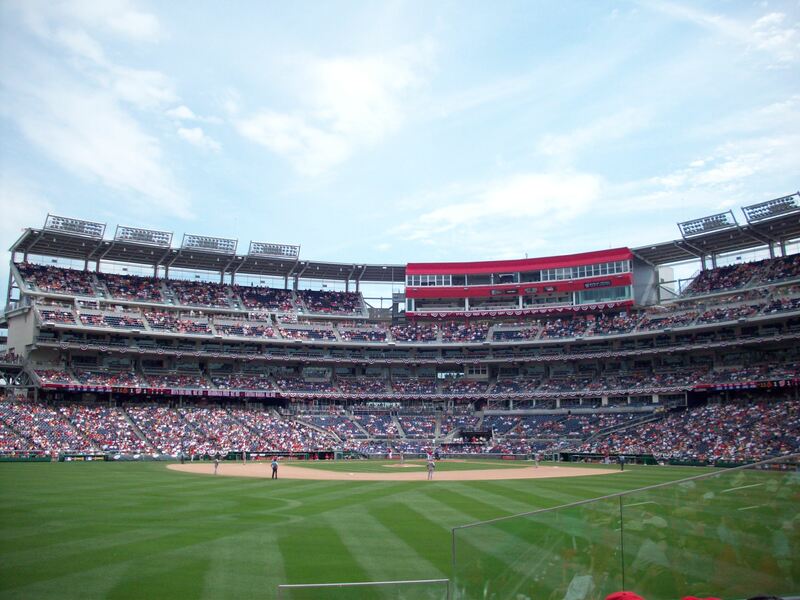 Located near the Anacostia River in the Southeast section of DC, Nationals Park was touted as the great hope for a much maligned section of the city. Blocks surrounding the initial footprint of the park were leveled to make way for new development. However, the building of the ballpark coincided with the start of the recession which has not led to a ton of development surrounding the park. The only bar/restaurant close is The Dugoutwhich is really only a temporary bar (down to the temporary porta-potties) set up on game days. The Dugout has become an extremely popular pre-game destination with live music, tents and games of corn hole. It’s almost like a tailgate without your car. 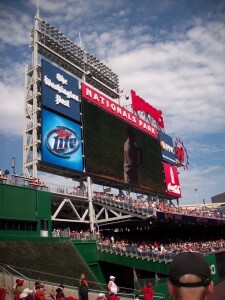 Nats Park is also only a mile from the Capitol Hill neighborhood and is a short walk to its many bars and restaurants. Parking has been an issue since before the stadium was built. Debates raged about whether the parking decks surrounding the park should be above or below the ground level. Due to the ever-growing price tag it was decided that the parking decks would be built above ground. This did have one unintended consequence. Now instead of a view that is unmatched by any other ballpark in the majors, one with a view of the Capital and the Washington Monument, the only thing that you see behind the ballpark is a bland parking deck. They even added a large red tent to the top level of the parking deck which further blocks the view of the monuments of downtown DC. 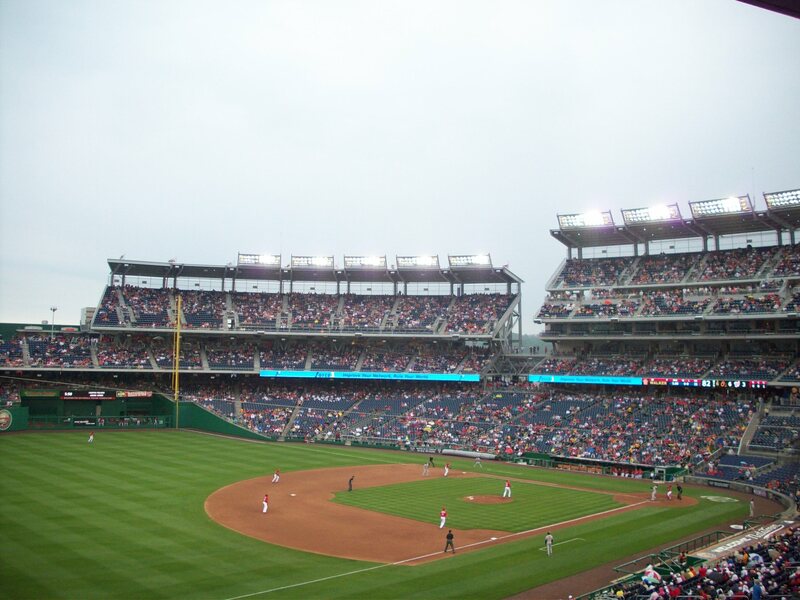 The Washington Post recently ran a story that stated that FedEx Field, which is roughly 12 miles outside of the District, actually has a better view of the Capital than Nationals Park. If you are looking for seats where you can see the game and the Capitol at the same time you want to be in the upper deck down the first base side. However, as the development picks up around the park and buildings go up behind in the surrounding blocks the backdrop is sure to change in the coming years. While many people have complained about the view behind the stadium, the builders knew that the development would eventually block any view of the Capitol anyway. 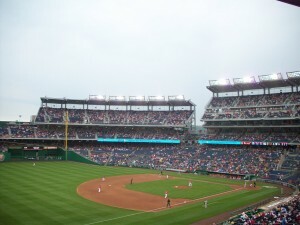 With parking being an issue many people take the Metro to Nationals Park and the District had to expand the local station to handle the traffic. It is only a block to the center field entrance where most people enter the park. The Nationals have done a good job of making this walk a festive environment. There are vendors set up, numerous scalpers, and even multiple mascots who will cheer, dance, and pose for photo ops. Upon entering you are immediately greeted by three statues of players from Washington’s previous teams, Walter Johnson, Josh Gibson, and Frank Howard. Right behind the statues is the building that houses the Red Loft Bar and Red Porch Restaurant. This is a popular spot with young professionals and it turns into quite the bar scene, where people sometimes forget there is even a game going on. The Red Porch is also one of the best places to get craft beer in Nats Park. 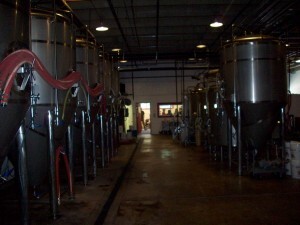 On top of the traditional macrobrews, they also serve beers from Dogfish Head, Bell’s, Stone, and sort-of-local breweries such as Williamsburg Ale Werks and Flying Dog. The park has also brought in local foodie establishments into the park such as Ben’s Chili Bowl (a DC institution), Hard Times Chili (a DC area chain) and Noah’s Pretzels who faithfully produce the Nat’s Curly W logo in pretzel form hundreds of times a game. In 2011, they added four new eateries to the Miller Lite Scoreboard Walk (which is located below the enormous 4500 square foot HD scoreboard). They include Blue Smoke, Shake Shack, El Verano Taqueria and Box Frites. 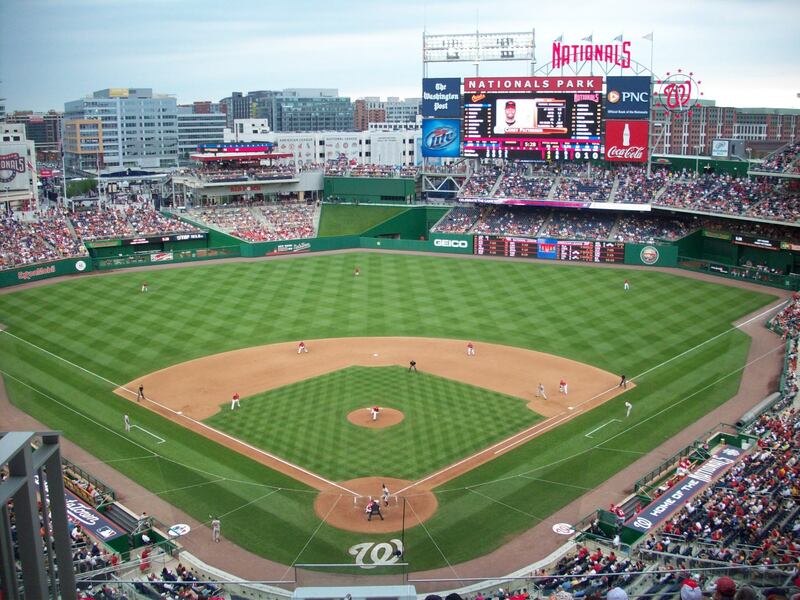 While most ballparks built in the last 20 years have gone for the retro look made popular by Camden Yards the Nationals wanted no part in the retro park craze. The glass and concrete façade give the park a much more modern feel than most ballparks being built today. The park was built with pre-cast concrete to give it the look of limestone to fit in with many of the buildings that span The Mall in downtown DC. It was actually inspired by the East Wing of the National Gallery of Art, designed on I.M. Pei. The buildings of D.C. are not the only pieces of architecture that the architects borrowed. While the view of the Capitol and the Washington Monument might be obstructed there are other elements to make this a distinctly District ballpark. They have planted cherry blossom trees behind the left field bleachers similar to the ones you would find along the Tidal Basin. They also included an angled wall in right-center to mimic the outfield wall of Griffith Stadium, the old home of the Senators. The Nationals have also tried to reference importance of the city they represent in the names of different sections of the stadium. 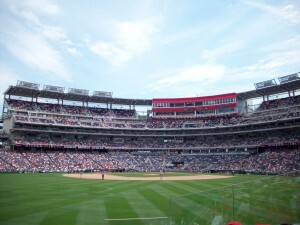 For example, the Presidential Seats right behind home plate are cushioned, and patrons in these seats can drink in the Oval Office Bar located underneath the lower deck. There are also the three different levels of suites named after famous residents of the city (Washington, Jefferson, and Lincoln). To the right of the Red Loft Bar the stadium opens to a wash of blue seats and the field. The entire stadium is made up of blue seats except for a small section of red seats in left center in front of the Red Porch Restaurant (hence the name). Many of these blue seats remain empty as the Nationals have struggled with attendance issues in the past years and getting cheap tickets on the secondary market has not been a problem. However, with a roster that included Stephen Strasburg and soon to include Bryce Harper the Nationals hope that will change in the upcoming years. Nationals Park has three separate concourses. The main concourse surrounds the entire field and you can watch the game from almost every angle (the PNC Diamond Club blocks the view from behind home plate). The second concourse starts next to the Red Loft bar and wraps under the scoreboard and follows the 200 level. The upper concourse has access to the 300 and 400 level seats. No matter where you are, make sure you take time to take in the President’s Race in the middle of the 4th inning. The Presidents of Mount Rushmore, or as they’re known at Nat’s Park, George, Abe, Tom and Teddy race around the bases a-la the great brat races of the Milwaukee Brewers. These characters are hugely popular, with most people pulling for Teddy Roosevelt, who in all the years, and all the games has yet to win a race (he’s even got multiple online supporters, including the fun to read “Let Teddy Win” blog). On their off days, the Presidents are known to make appearances around town, and even have a recurring cameo in the Washington Ballet’s production of the Nutcracker. 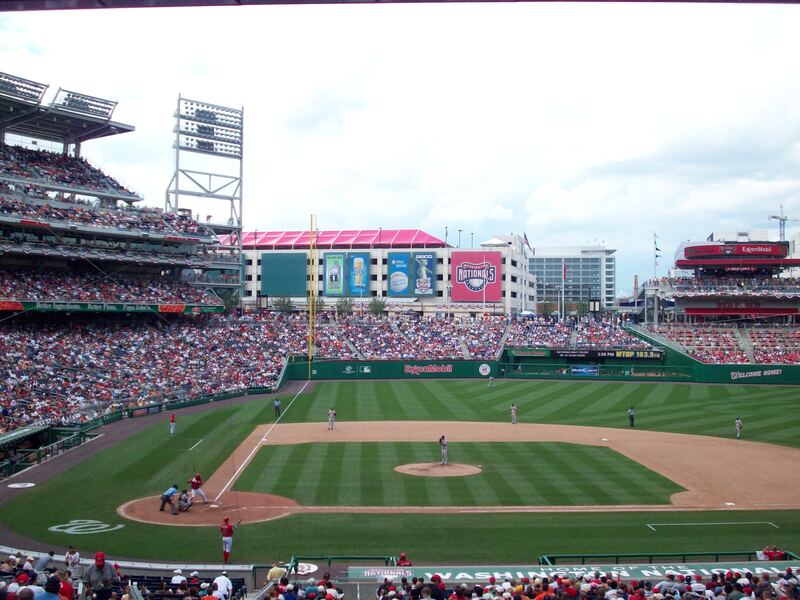 Baseball Nerd Fact 05: Interestingly enough, the Expos move to DC made them the first MLB team to be relocated since the Senators had left the District and headed for Texas. Brew Basics: A small outfit with big ideas. We stopped by 10 minutes before the start of business, on only the third week they had ever been open to the public, and were amongst a half dozen people waiting to be let in. Apparently, this is nothing compared to the line that went down the walk and a bit up a hill on the first Saturday. Being a newcomer hasn’t gotten in their way at all; they are already available in more than 100 local bars and restaurants, (DC only!) so the word has gotten out. And the word is good. DC Brau can’t keep it on the shelves. Their tiny cooler is almost empty, they only have one of their styles available to purchase in cans, and they’ve already gone through 200 growlers, and had to place an order for twice that. Their porter is so in demand, that apparently the one bar (out of the hundred+) that had in on tap was holding back a keg, and Tweeted its release the weekend before. During our time there, several people asked about the porter, trying to nail down exactly when it would be available and how to get it. 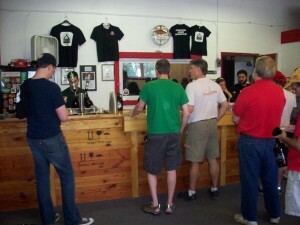 Our tour guide was the CEO of DC Brau, Brandon, who seemed a bit giddy (and slightly surprised) at the popularity of his tasting room. The other man on deck was head brewer Jeff, who also was busy with tours, but seemed mostly to like hanging around watching people enjoying his beers. 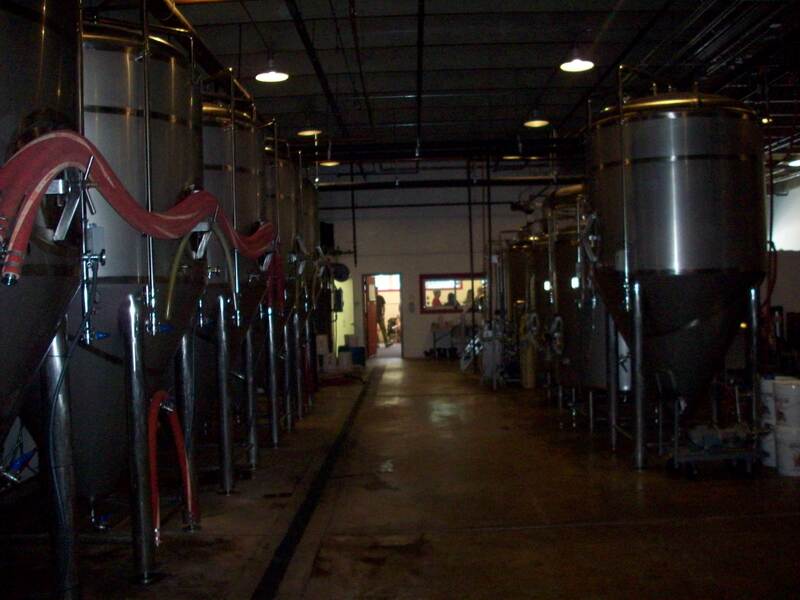 Happily, with their recent success DC Brau was able to hire a third employee and have 2 new 60 barrel tanks, and a new 66 barrel brite on order, increasing their production by up to 66 percent. Hopefully as continued success, leads to continued cash flow, these guys will be able to expand and see all of their ideas come to fruition. In addition to canning two more of their beers, they are hoping to add a hefeweizen and golden ale to the lineup, and are currently working collaboratively to create a spruce tip version of their porter – hopefully in time for the Christmas season. They’ve also linked up with Catoctin Distillery to add some bourbon barreled options to the mix. Catoctin Distillery being the first distillery in Virginia (since prohibition) is poetic, as DC Brau is the first brewery in DC since 1956. Finally, and creatively, they also jumped on an opportunity when they saw it, and purchased some barrels from a vineyard as it closed, so their first batch ever is being soured in Cab Franc barrels, and will be released April 15, 2012 to celebrate their first anniversary. 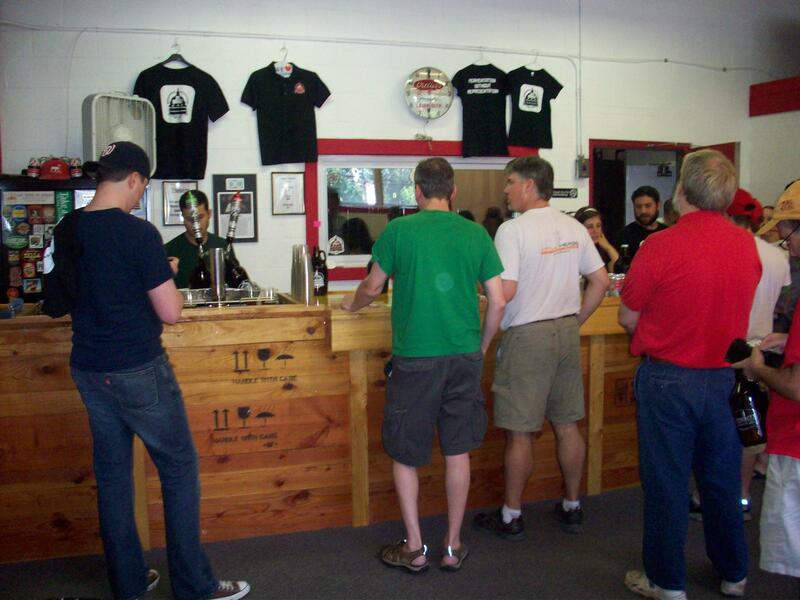 As well and good as all these things are, as mentioned their beer is in high demand – and not so easy to come by on the day of our initial visit, there were only two available to taste (starred below). So we’ve kept an eye out whenever we passed through the DC area, and grabbed what we could and added to our list as often as possible. 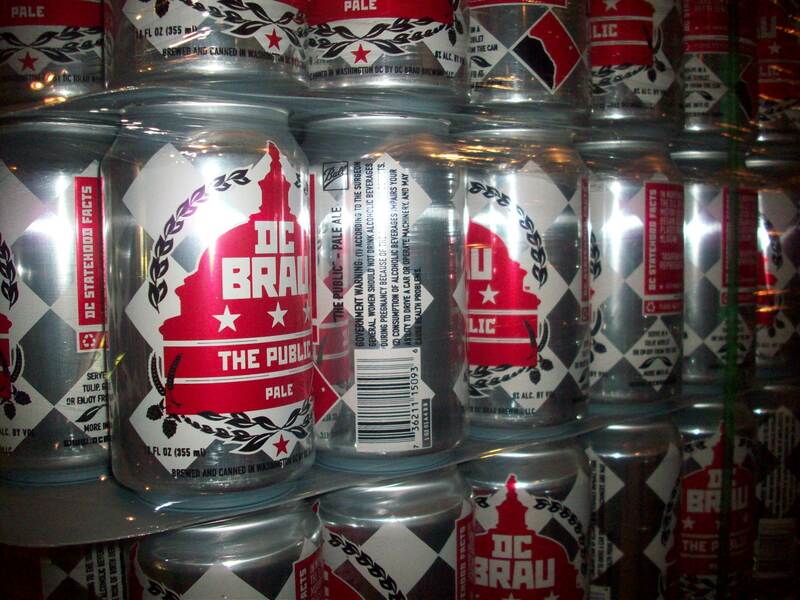 One other note – like many breweries today, DC Brau has determined that cans are the future of all good beer; but if you are one with the mentality that cans are cheap, or alter the flavor of beer, don’t let their canning turn you off. First, you really should give it a try: it’s more environmentally friendly, supposedly actually helps keep the true flavor of the beer intact, and cans are accepted all kinds of places glass bottles are not. But if you really aren’t up for drinking from the cutting edge can, you can find some of their brews in 22oz bottles to console you. 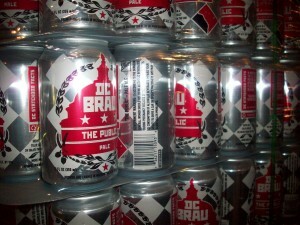 *December 2011 update: DC Brau continues to make headlines, gain popularity and impress the locals. They’re rolling out a steady stream of experimental batches and seasonals along with the cans and growlers of their year ’round taps. Still only available inside D.C. city limits, you’ll just have to head on over to the Nation’s Capital if you want a chance to partake in what they’re brewing up. The Corruption IPA **(6.5 ABV/ 80 IBU)– Refreshing and surprisingly spiced. DC Brau does not add sugar to their recipes, which means this copper hued beer isn’t sweet like some IPAs we have tasted lately. The hops are pronounced, with sharp bitters and complimentary spices in both aroma and palate. The Public Pale Ale**(6.0 ABV) Their breakout beer, brewed in the American Pale Ale style. The Public has a reddish tinged almost rust color, and a hoppy aroma with just a hint of citrus. While drier than the Corruption, it has a similarly robust flavor fills your mouth and is slightly tingly on the tongue. Like their other beers, it is strong, hoppy, and not sweet. Fermentation Without Representation Pumpkin Porter (7.9 ABV) – A limited edition collaboration with Epic Brewing of Utah and quite possibly our favorite of the beers from DC Brau. The porter has a dark chocolate brown color and white lacing, and produces a strong aroma of coffee with hints of pumpkin spices (like nutmeg). It is medium bodied with obvious carbonation, and in some ways reminiscent of a Guinness in that it is smooth, rich and fills you up without weighing you down. The taste comes in mostly toward the end of the sip and through the swallow with hints of pumpkin, mainly wood and earthy notes and a dry finish.